How was every body's Thanksgiving? I'd bet it was full of joy and of course, tons of food for you all. In case you're tired of turkey and are craving for some Chinese food, here's my lamb stir fry recipe with a spicy kick. Mix 1 tablespoon of corn starch with 1 tablespoon of soy sauce. 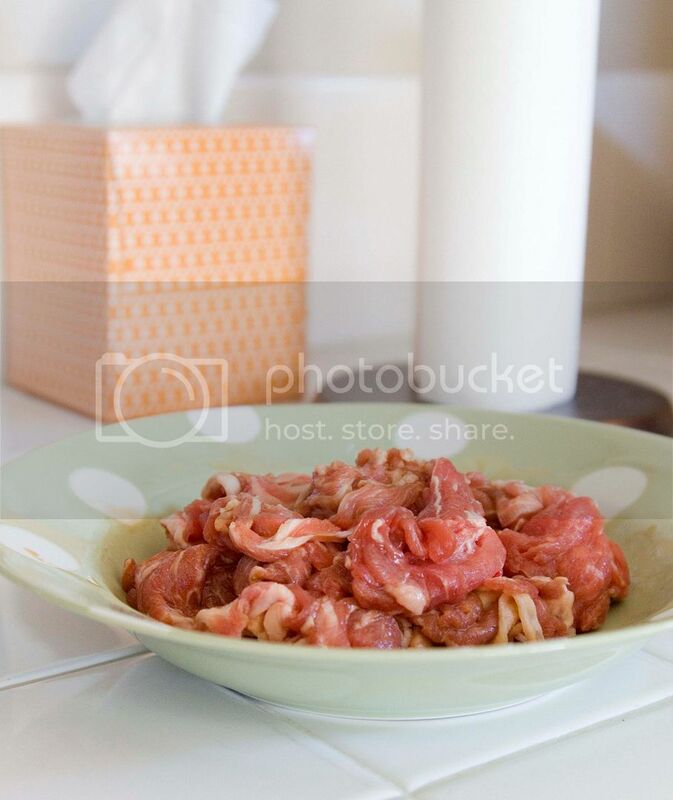 Use this mix to slightly marinate the shabu grade lamb slices for 10 to 15 minutes. Peel and slice the garlic cloves. Cut the root off the leek and thoroughly rinse the remaining part under running water. One done, pat dry and slice the leek diagonally. Remove the stems from the jalapeño and cut lengthwise. Discard the seeds then slice the jalapeño into strips. Red jalapeño gives this dish a pop of color. 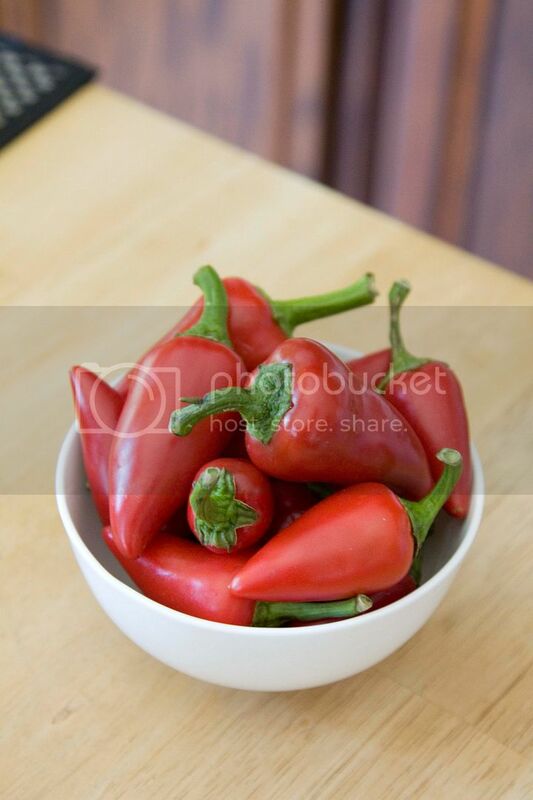 Usually the jalapeño needs to be quickly fried in oil to better maintain its vibrant color. However, just omit the frying part for the sake of easy cleaning and healthier dining, especially when cooking at home. If you can't find red jalapeño, a good old green breed works just as well. Drizzle some olive oil to the pan. Add in the leek, some salt, and some black pepper. Turn to medium high heat and cook for about 30 seconds. Add in the garlic slices and jalapeño. Cook till the garlic turns slightly light brown color. Add in the bean sprouts together with 1 tablespoon of soy sauce, 1 tablespoon of black bean soy sauce (thicker than soy sauce), 1 tablespoon of rice vinegar, and 2 tablespoons of Chinese rice cooking wine. 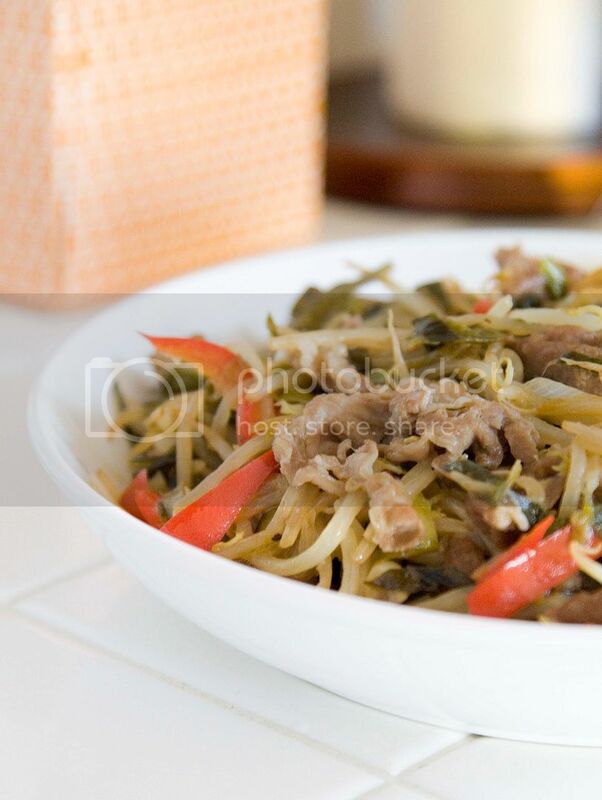 Give it a quick stir and cook till the bean sprouts reach desired texture, about 1 to 2 minutes. Lastly, turn up the heat and add in the lamb slices. Stir fry the lamb till just fully cooked. 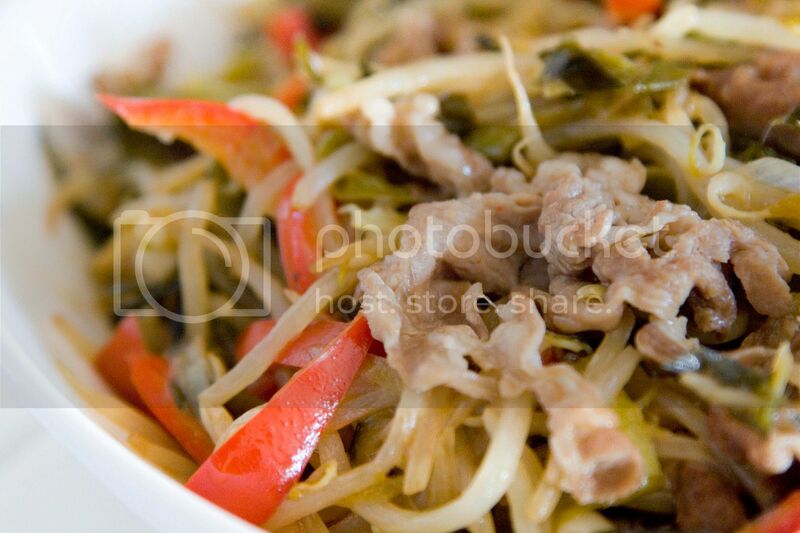 Make sure to "stir" fry throughout because the use of corn starch might cause the meat slices to stick together. Once ready, remove from heat and ready to serve. I removed the seeds from the jalapeño mainly for a smoother bite. Otherwise, if you don't mind having tiny seeds stuck in between your teeth, just keep it for an even more fiery effect! By the way, I come from an Asian family so we don't really celebrate Thanksgiving. As a result, it became my get away time of the year. I was in Japan during the past few days and can't wait to share my food adventure with you! Stay tuned! 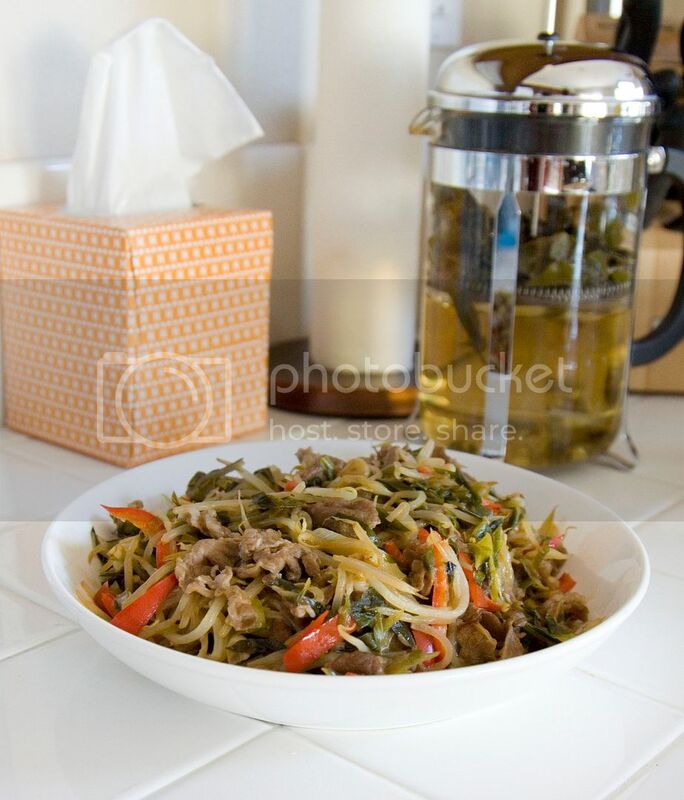 Like that your stir-fry is loaded with veggies and the lamb certainly flavor up everything. Thank you! This dish was indeed sour and spicy, very good with rice!